Michael Bloomberg is an American billionaire, a businessman, author, politician and philanthropist who grew from a middle-class family, worked his way up from a bank’s vault to make a fortune as a marketer of financial information. Today, his success story (wealth and fame) and the path he took in its realization has formed a yardstick which so many aspiring entrepreneurs all over the world evaluate themselves with. Being someone who came from a humble background, Bloomberg’s life story and the events thereof will be an interesting piece to read anytime any day. He is one of the wealthiest men in the world – Michael Rubens Bloomberg – and he was born on the 14th day of February in the year 1942 at St. Elizabeth’s Hospital into a middle-class family that had their abode in Brighton neighborhood of Boston, Massachusetts. His family is Jewish and he had as his younger sister, Marjorie Tiven; mother, Charlotte (Rubens) Bloomberg; and his father, William Henry Bloomberg. Both of Michael’s parents are late now, but while they lived, his dad worked as an accountant 7 days a week on a local dairy farm, his mother’s occupation is, however, not known. Growing up, his family moved from Allston to Brookline before they moved into Boston suburb of Medford, Massachusetts where he attended Medford High School. They continued living there till Michael Bloomberg graduated from college. In his days at Johns Hopkins University, the potential business mogul was a member of the Phi Kappa Psi fraternity, constructed the school’s blue jay mascot and finally graduated in the year 1964 with a Bachelor of Science degree in Electrical Engineering. Two years after his college graduation, Rubens earned a Master of Business Administration from Harvard Business School in 1966. Following this, he applied to and was hired by Salomon Brothers in New York to work in their bank vault where they counted billions of dollars of actual bond and stock certificates which are to be sent out to commercial banks as collateral for overnight loans. As Bloomberg labored in this tedious work in an un-airconditioned bank vault, he diligently worked (12 hours a day in 6 days of a week) and grew to a bond trader and then in 1972, he was made a general partner who headed equity trading and later systems development in the bulge-bracket Wall Street investment bank. In 1979, something which ordinarily seemed like a demotion but was in an actual sense a precursor to the new wave of digitization happened to Michael Bloomberg. The CEO of the company, John Gutfreund and Billy Salomon asked Bloomberg to head the emerging computer systems area. He would later come to be thankful for this. Nevertheless, in the course of time, Phibro Corporation acquired Salomon Brothers as the later went public on Friday, July 31, 1981. This event marked the exit of Michael Bloomberg from the firm where he grew from working in a vault to being in the corridors of power. He was asked to leave with some others and his parting package was $10 million in cash and convertible bonds. With this money, he set out to establish his own company; an information technology company through which he hoped to offer transparent and efficient services to buyers and sellers of financial instruments. He would invest $4 million as the principal sum in setting up a computer system that could provide information about bond markets. Bloomberg first called his company Innovative Market Solutions and it had 4 others as its initial employees. In 1982, Michael Bloomberg’s company was already gaining attention and Merrill Lynch (Merrill Lynch Wealth Management) became the company’s first customer as it purchased 22 Market Master terminals of Bloomberg’s company in addition to a $30 million investment which represented a 30% stake in the firm. The company then changed its name to Bloomberg L.P in 1986 and relocated to 499 Park Ave. in New York. By 1989, Bloomberg bought back 1/3rd of Merrill Lynch’s 30% stake for $200 million. In the 90s, Bloomberg TV, Bloomberg Business News, Bloomberg Markets Magazine and Bloomberg Radio were all launched. Michael grew the company to a global brand employing more than 15,000 people across its offices all over the world. Outside of his many business interests, Michael Rubens Bloomberg served as the Mayor of New York for 12 years starting from January 1, 2002, to December 31, 2013, as a Republican in 8 of the 12 years while in the remainder, he was a political Independent. When Michael Bloomberg joined the investment bank Salomon Brothers in 1966, his earning was $9,000 per annum but for his wise investment decisions after leaving the firm with a $10 million severance package in 1981, he has amassed a net worth of about $45.2 billion. This has notably secured a spot for him as one of the richest people in America and the entire world. The American businessman, politician, philanthropist and author has been married twice with the first ending in divorce. 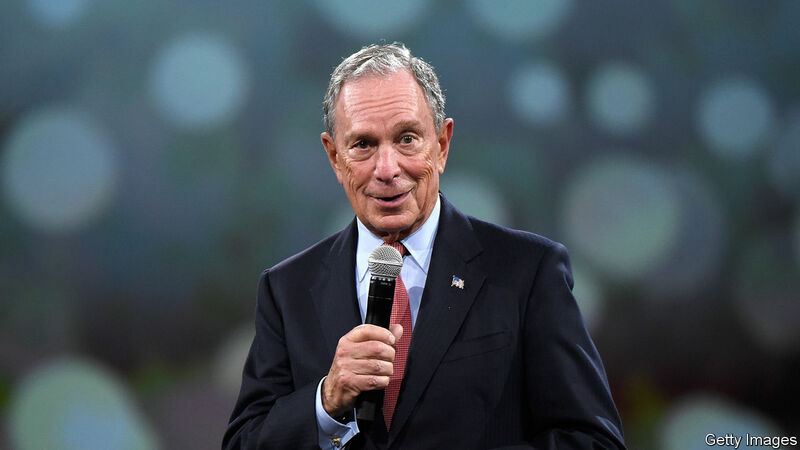 Bloomberg was first married to a British woman who goes by the name Susan Elizabeth Barbara Brown, with her, he had two daughter; Emma (born in 1979, now married to Christopher Frissora, the son of billionaire businessman Mark Frissora) and Georgina (born in 1983). However, 10 years after their youngest child was born, the couple divorced. Bloomberg maintains that they have remained best friends since then. Beginning in the year 2000, the billionaire business mogul found comfort in the arms of Diana Taylor, a New York state banking superintendent who he has been living with since then. The billionaire stands at a height of 5 feet 7 inches or 1.70 m. He is certainly not the tallest man in America or in the world, but where money and fame counts, Michael Bloomberg towers comfortably above many others.